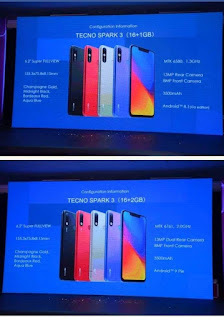 Recently Tecno added 2 smartphones to their portfolio with the Spark tag and these smartphones are in different model but first let's look at the initial release of one of the spark before considering the later. Tecno has launched Tecno Spark 3 with spectacular features and a top notch. These smartphones are mid-range devices which has 6.2 inch display and 8MP front-facing camera with a 13MP + 2MP Rear or back camera. 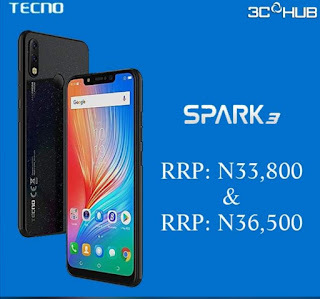 Looking at some of the Key Specs of Tecno Spark 3, it's has a 26GB internal memory which is expandable and a battery capacity of about 3500MaH . Tecno Spark 3 comes in two variants which she the 1GB RAM and 2GB RAM and a different chipset embedded in each of them. Also to remember the display is an IPS LCD with 720 x 1520 pixels let's look at some of the notable specs on Tecno Spark 3. Tecno spark 3 has a 6.2-inch IPS LCD Display with 1520 x 720 pixels. A two variants device that comes along with 2GN RAM running on Android 9.1 pie and 1GB RAM running on Android 8.1. processor of Quad-Core clocking St 2.0GHz with MediaTek MT6761 Helio A22 for 2GB RAM Version while 1GB RAM Version Quad-Core 1.3GHz MediaTek MT6580, 16GB built in storage capacity for both variants, 3500mAh battery capacity and 13MP + 2MP rear and 8MP front facing camera for both variants. The colours comes in black, purple, Gold and Red made with plastic and looking shinny in it's colours. A top notch device of a bathtub one and noticable chin down at the bottom of the smartphone, display of 6.2 inch-display. It comes aloge with a LED flash on the 2GB of RAM variant which is dual while sing LED flash on 1GB variant. 2 Sim slot and a dedicated MiscroSD slot for Memory expansion. Both having a 8MP front-facing camera but the Go Edition which is the 1GB RAM variant has only 13MP rear camera with no dual camera unlike the 2GB variant which has 13MP + 2MP secondary or rear camera. Tevno spark 3 2GB variant has a Quad-Core MediaTek MT6761 Helio A22 while 1GB RAM variant has Quad-Core clocked at 1.3GHz MediaTek MT6580 with Hello A22 Soc. Both are expandable with microSD card and both has a 16GB internal storage. Tecno spark 3 has 2 variants which the 2GB RAM runs on Android 9 pie having a Tecno HIOS skin on top while the other have 1GB RAM running on Android 8.1 Oreo Go Edition with HIOS skin too. No fast charging although the smartphones variants are having 3500mAh battery capacity which also doesn't have LTE on both variants as it has a network of 2G 3G others notable networks are Bluetooth, 3.5mm jack, wifi direct,wifi, GPS and a microUSB port for charging and transferring of Files across devices.